Closets do more than just provide a place for you to hang your clothes. They reduce stress and save time by helping you to stay organized. In addition to providing wardrobe space, closets are used for such things as storing linens, toys, and food or hiding clutter. While closets come in a variety of shapes and sizes, there are two basic types: reach-in and walk-in. When space allows, a walk-in closet provides the most usable area and allows you to move around inside the closet. Although typically much smaller than walk-in closets, reach-in closets can also be very functional. If your closets are not providing the storage space and organization that you desire, you can benefit from using a custom closet design service. 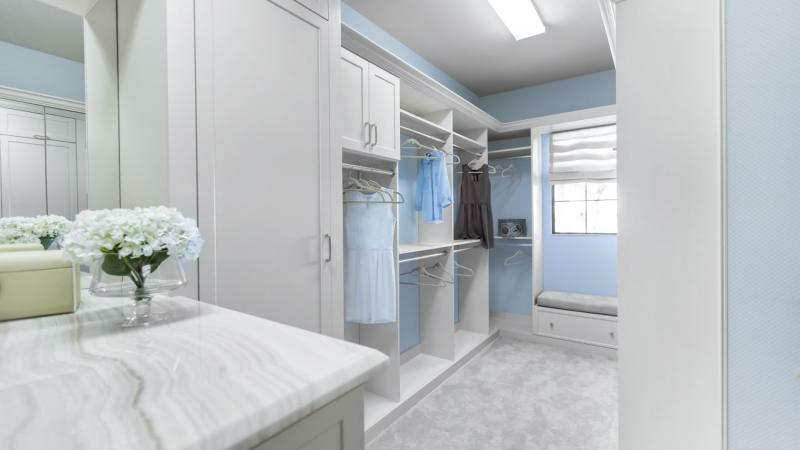 Here are five ways that custom closets save tons of space without breaking the bank. Space is a valuable commodity. When trying to fit everything into your closet, you need as much organization as possible. This is where the beauty of a custom closet comes in. A custom closet uses shelves, hanging fixtures, and drawers to maximize your space and provide organization. When you sit down with a custom designer and explain why your existing closets are failing to meet your needs, the designer can work with you to create a configuration that fits your lifestyle and allows you to keep your clothes organized and readily accessible. Unless you expand your closet space, you only have so many square feet to work with. Because of this, it is important to maximize the space as much as possible from floor to ceiling. This can be accomplished by utilizing such features as closet accessory organizers and multi-level closet rods. Complete closet systems are also available that include shelves, bins, and compartments. Storage bins and cubby holes provide additional space for you to hide dirty laundry and keep your shoes organized. Custom closets will save you a lot of time, because you will be able to stay better organized and find things more quickly. If you have a dedicated space for your shoes and accessories, you can avoid the panic of searching for the right items to complete your look. You can even have a special place reserved for tomorrow’s wardrobe, which will save you time getting ready for work. If you have children, you can help them stay better organized with custom closets. This will benefit the entire family by saving time and reducing stress. In addition to saving you time and helping you to become better organized, custom closets are more attractive and add to the overall appearance of your home. Functional items, like mirrors and lights, also help to enhance your closet’s appearance. An uncluttered closet looks larger and more attractive than one where everything is crammed into a space that is too small. High-end touches, such as crown molding and custom cabinets, can be used to make a closet look absolutely beautiful. With the right design, a custom closet can become an extension of your bedroom. It can include a dressing area with beautiful wallpaper, mirrors, plush carpet, and crystal lighting. The addition of such a closet to the master bedroom can yield a bedroom suite that is glamorous as well as functional. Luxurious materials, such as leather and parchment, can transform the look from ordinary to spectacular. Modern technology, such as LED closet rails, have the ability to convert ordinary closet components into showcase items.2 Custom glass and drapery can also be employed to create a luxurious feel. In addition to streamlining your life, making you more organized and saving you time, custom closets can also increase the value of your home. Prospective buyers will look inside your closets, because they want to make sure your home has enough storage. If your closets are crammed full, it will appear that your storage space is inadequate, which can devalue your home. It is easy to get a free in-home estimate for installing custom closets. The process begins when you schedule an in-home consultation with a designer who will listen and take notes as you explain your needs as well as any ideas you have. The designer will also measure your available space and take an inventory of your clothes and other items that need to fit within that space. This should only take an hour or so of your time. The designer will then create a design that they will share with you. Some designers use sophisticated software to create a 3D model that makes it easy for you to visualize your space once the improvements have been made. The model typically includes such things as lighting, accessories, and finishes. If you are not happy with the design or want to tweak it, most designers will be glad to do that for you.